Travel Docs Peacock Bass Association with fishing trips to the Amazon for peacock bass anglers. Document Safety Tip for Travelers! - Here's a great travel tip (that I have used) . If you don't have access to a scanner, use your digital camera and snap a good (small jpg) photo of your passport (first two pages) and (if you have one) your Brazilian multi-year Visa. Take a second picture (or more) of your credit cards, driver's license, Insurance card(s) or other important info in your wallet. Transfer the images to a file on your computer or get a CD made at the camera store with the digital images. Send yourself an email with the images (as attachments) with Subject(s) marked "Passport", Credit Card", or similar. The digital image attachments will be accessible (if you can access your email from anywhere) at any time in the future from any location. If you lose one of the cards or passport, need one of the numbers on them, or if one (or all) of them is stolen, you can easily get on a computer and look up your information by going to your own email account from anywhere. This is a safety tip that all travelers should find valuable. Even in small, remote places, there is often a laptop or "internet café" or hotel computer "center" that can provide web access in an emergency. Website Help with New Passports or Renewals - This is a strong reminder to get out your passport and check the expiration date. Also if you are going to Brazil, be sure to verify that your visa is still valid for those having a multi-year visa. If you need to renew your U.S. passport or get a new one, go to www.Cerenade.com/Passport for forms. With the new rules about all U.S. citizens needing passports to return to the US from anywhere, the National Passport Center is overloaded. It is taking up to 10 weeks (and more) to process applications now. The www.cerenade.com/passport site eliminates a trip to the post office to get the forms, and it even allows you to type info right on the forms before you print it out. There is no charge to view, complete, save or print the passport forms. 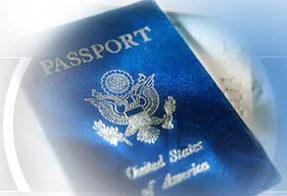 For more info on passport requirements, see the U.S. State Department. A Safer Way to Keep Your Documents - After my short article, "Document Safety Tip for Travelers" in last month's eZine, I got taken to task by PBA member Carlton Howard (a member of the financial security industry). His email said in part, "Your "Document Safety Tip" was WAY off base and is a HORRIBLE suggestion. Credit card data is bound to be stolen through this idea. A public pc is NOT the place to surf for private, confidential information. They are ALL most likely loaded with mal-ware and other malicious things. Shame on you for recommending it. Stuff like that should NEVER be attached to any email and sent anywhere." He doesn't mince words, does he? I have seen the tip that I passed along in a few travel newletters etc., but he is correct about the risk over non--secure email routes, especially from public computers. Using encryption is always by far the best route! He continued , "Spyware and keyloggers are said to be found on 1 out of 3 PC's. A public PC is about 100% sure to have some kind of malware installed. With the keylogger info, if your email ID and password is caught by keyloggers (and it would be) then the hackers now have access to your email account with the stored info." Carlton suggests that "Folks could take a picture on their camera phones and store it on the phone." He went on to say, "Best bet is the old school method. Photocopy all sensitive stuff on the ol' neighborhood copier, and leave some copies with several state-side trusted loved ones and carry two copies in your personal carry-on luggage (NOT in one's checking luggage)." I am not sure that leaving a couple of copies in the personal carryon is wise however. Carlton continues, "If they absolutely need to email this type of data then they need to ensure that the emails/documents/pictures are encrypted. There are many free programs that will allow users to combine multiple files into a "self decrypting archive" that is protected by a password. Only with that password will you be able to unencrypt the archive and view the files. After one encrypts the file you can safely email the file to yourself for storage. The risk you run from that point is again the keylogger aspect when conducting the unencrypt. If you can find a trusted PC or computer you will be much better off." I am glad Carlton responded, and coincidentally, I received great info from another travel company (with Fodor's Travel publications as an independent source). The website, www.keepyousafe.com acts as an online safe deposit box to provide travelers with peace of mind should they lose important documents (passports, bank cards, driver's licenses, etc. ) while traveling. Fodor's Travel Wire recently described www.keepyousafe.com as an "innovative and useful" travel essential. KeepYouSafe.com enables consumers to securely store their most important records online and then access those stored records from anywhere, at any time, via the Internet. Each box's contents are protected by the same strong encryption and other security technologies used by the U.S. military to secure top -secret data for access from any place with Internet access: the embassy, an Internet café, a library or a hotel. (according to Fodor's Travel Wire (http://www.fodors.com/wire/archives/002317.cfm).) The basic Online Safe Deposit Box is free. I've signed up for a box. Yellow Fever Proof Required - It has been reported to me from a PBA supporting member and agent that currently all anglers going to Manaus on COPA Airlines connecting through Panama City (Panama) are being asked to show proof of their yellow fever vaccination prior to boarding the Panama City/Manaus leg of their trip down. Those flyers without the vaccination card to show authorities in Panama City are not currently being allowed to board the plane. Brazil apparently is looking for proof upon entry from those who enter the country after stopping in Panama. Yellow Fever Vaccination - One (or maybe two) Brazilian consulates are now requesting proof of yellow fever vaccinations when you try to obtain your visa, according to a couple of members. Most other consulates are not requiring anything of the sort, so that's just one more unknown that we have to deal with when we apply for the 90-day, one year or 5-year visa that is sold (time of expiration at the discretion of the consulate office employees) to U.S. visitors. Yellow Fever & Hepatitis A&B Info - Yellow fever occurs in certain jungle locations of South America, where the virus is maintained in a cycle among forests, mosquitoes, and monkeys. In South America sporadic infections occur almost exclusively in forestry and agricultural workers who are exposed occupationally in or near forests. Yellow fever is a viral disease transmitted between humans by a mosquito. General precautions to avoid mosquito bites should be followed. These include the use of insect repellent, protective clothing, and mosquito netting. Yellow fever is a very rare cause of illness in travelers, but most countries have regulations and requirements for yellow fever vaccination that must be met prior to entering the country. Yellow Fever Vaccine - This vaccine is administered as a one single injection. It can be administered by your local health department or a travel medicine clinic at a nearby major hospital. Family physicians will not have access to this vaccine. Do not receive the vaccine if you are allergic to eggs or are pregnant. The immunization, and resultant certificate, is valid 10 days after vaccination. You will not need a booster for 10 years. Hepatitis A transmission may occur by direct person-to-person contact, from contaminated water, ice, or shellfish harvested from sewage-contaminated water; or from fruits, vegetables or other foods which are eaten uncooked, but which may become contaminated during handling. Recent studies have shown that many cases of travel-related hepatitis A occur in travelers with "standard" tourist itineraries, accommodations, and food and beverage consumption behaviors. Depending on the particular vaccine you receive, it is typically given in two doses, the second dose anywhere from 6-18 months after the first. Although much more difficult to contract (typically through IV drug use, sexual contact and other contacts with blood and body fluids), your local health department, travel medicine clinic or physician may advise a Hepatitis B vaccine as well. Editot's Note: Tips reprinted with permission from PBA's "The World of Peacock Bass" monthly eZine. Return to Information Central Contents page.